St. Gianna is easier to relate to than many earlier female saints who were virgins, queens, or martyrs. She was a doctor, a working mother, who was married to an engineer. Born in 1922, she experienced many of the amenities of modern life, like telephones, trains, planes and automobiles. Her letters to her husband were gathered and published in a beautiful volume back in 2002. But her letters tell only half the story. 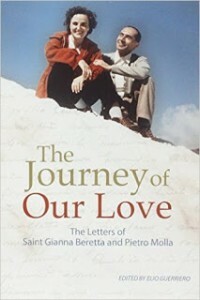 After her husband Pietro’s death in 2010, his letters were published alongside hers in a book entitled The Journey of Our Love (Pauline, 2004). The book offers us an intimate look into the private romantic life of a married saint. Rarely do we come to know another’s marriage well. Behind the smiles are often tears, and behind closed lips are often unshared sorrows. The letters between Gianna and Pietro reveal their life, unfiltered, and it’s an inspiration to behold. Keep my family and my dear ones safe, happy, and peaceful in the way of your light, today and always until the day we will fly up, up, always higher, up to you. Amen. In this prayer, Pietro naturally wove the smallest details of his daily life into a hymn to the divine. Gianna’s sweetness and caring appears consistently in her letters, and Pietro shows himself to be a man worthy of his wife. St. Gianna is regarded as a pro-life hero, since she died after a difficult pregnancy and childbirth in which she directed the doctors to save her unborn child first and then herself. Not everyone will be faced with such a drastic dilemma. But we can all follow the path of passion and compassion displayed in these beautiful love letters between husband and wife.